Coming fresh on the heels of news that the California Supreme Court won’t halt construction while they consider an appeal filed against the Expo Line Phase II, comes news that a different Expo legal challenge has been resolved. 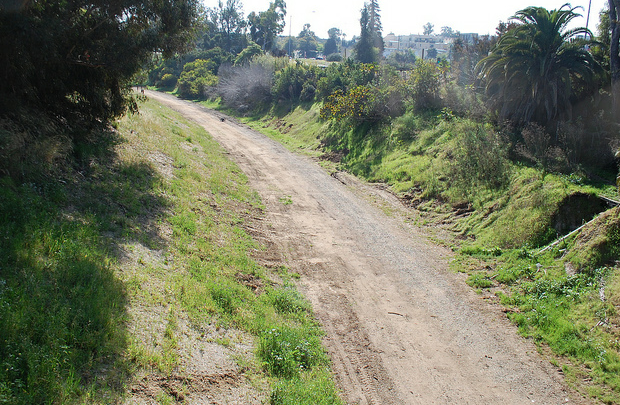 Last May, a group of Cheviot Hills homeowners filed sut against the portion of the Expo Bikeway last May arguing that the environmental documents prepared for the bikeway were insufficient. Word leaked earlier this week that a settlement was reached between LADOT and the litigants. While details of the settlement are not publicly available, Streetsblog has confirmed that design and construction of the bikeway through this area can proceed without further litigation. The lawsuit only protested the portion of the bike route in the City of Los Angeles, and not the part in the City of Santa Monica or Culver City. The 3.85 miles of bikeway will run mostly along the Exposition right-of-way except for a portion on the street in Cheviot Hills. In exchange for dropping their lawsuit, LADOT will make provisions in the design to mitigate impact on the local homeowners such as extra lighting and a privacy wall. Meanwhile, supporters of the Expo Light Rail Line also received good news this week. As first reported on Streetsblog’s Twitter Feed, the California Supreme Court did not grant a stay to Neighbors for Smart Rail. This means that no matter how long the appeal takes, construction of the project can and will continue. Proponents of the project worried that even if the lawsuit fails, that a stay could still have killed the project. One source estimated the cost of shutting down and starting back up could exceed $100 million…money the Authority doesn’t have. The Northvale trench could potentially be a very nice place for the bike path but what about the tunnel? Is it wide enough to accomodate two trains, a bike path and the appropriate barriers between riders and the rail line? Diverting the bike path to the stretch of Northvale Road (accessible via Motor Ave) may be the practical solution. I also wonder about personal safety issues along this route. If bad guys wanted to take advantage of riders or pedestrains along this stretch it would be extremely difficult for anyone to come to their aid in a timely way. Even if this stretch were illuminated at night (a LOUSY idea from a light pollution point of view) that’s not going to alleviate a potential physical threat. I’ve seen a drawing of the tunnel cross-section, and there’s no room for a bike path… there’s BARELY enough clearance for two tracks plus enough space for evacuation purposes… we’re talking only a few inches more than is required. I interpret this as LADOT putting in a privacy wall instead of lighting for the mixed use path in the Cheviot Hills area. Something similar happened along the mixed use path between the I-405 and the Orange Line station after the lights were put in. There were metal shields installed half way around the light bulb fixtures to block the light on the side that faces the path wall and less than a handful of houses. Now there are small blotches of dim light that hits the path, which increases the necessity for lights on bikes in order to see what is ahead of you at night. The upside is that a wall should decrease the level of subjective danger riding along the Cheviot Hills area without lights and not having to waste time with delays in construction which could jeopardize completing it. Ultimately, constructing the path at the same time as the light-rail is much more important than the lightling. If, as Robb suggests, the tunnel isn’t wide enough to accommodate a bike path then cyclists will have to come over the hill via Motor Ave and Northvale Road. Northvale is a lightly traveled residential street. A bike lane can be painted on the asphalt but that might create parking issues for the narrow two lane road. There certainly isn’t any way that stretch could have any kind of wall. Once you hit the portion of Northvale that runs parallel to the trench it becomes a question of access. It’s a steep trench. Building a ramp to descend into it poses some serious engineering and construction issues. Will they really build that? Seems unlikely. Further down Northvale it’s conceivable that a path could run side by side with the train for the last 300 yards or so till it intersects Overland Seems overkill to build a privacy wall for the neighbors at this point if in fact the path is going to go through a neighborhood street anyway. If anyone, these are the neighbors who would be the most impacted and, no doubt, the ones who brought suit in he first place. The current thinking is to move the path entirely out of the trench onto Northvale starting at Overland. That could save possibly as much as 8 million dollars from the bike path budget. So it’s a serious option. It would also make to a nicer ride, not being next to train traffic down in a big ditch. Includes optional connection over a ped bridge to the park at Overland and the 10 exit, which is nice, and still includes the current dirt road behind houses, which is also quite nice, and minimizes climbs, which is good to not so hot cyclists. Seems like a win all around, except the homeowners don’t yet realize the advantage a nearby bike path will bring to their property valves and general travel convenience. This is likely to be the nicest part of the entire Expo bike path if it’s done right. Effron – That #%^$#$ train tunnel is much too narrow to include a cyclepath. I’m still rooting for cutting two 8 foot new tunnels for cyclists. It’s nowhere near as expensive as a car tunnel with tunnel equipment, but so far none of the engineers have considered this as an option for this or other tight places such as Sepuvada under LAX. Check out Old Motor Ave. It could be used to access the easement strip adjacent to the freeway, which could carry a bikepath south of the homes on northvale and walavista back to the rail line as it emerges from the tunnel below the freeway. Not as far to go up the hill, and you’re only alongside the freeway for the length of three lots and a cul de sac. Eric thanks for run-down of ‘current thinking’ –as someone who would frequently use the bike path –and who lives in the neighborhood– the route you indicate makes perfect sense. Not only for the cost savings but also for the footbridge connection which opens up access to the path from west of the tracks. Fingers crossed.